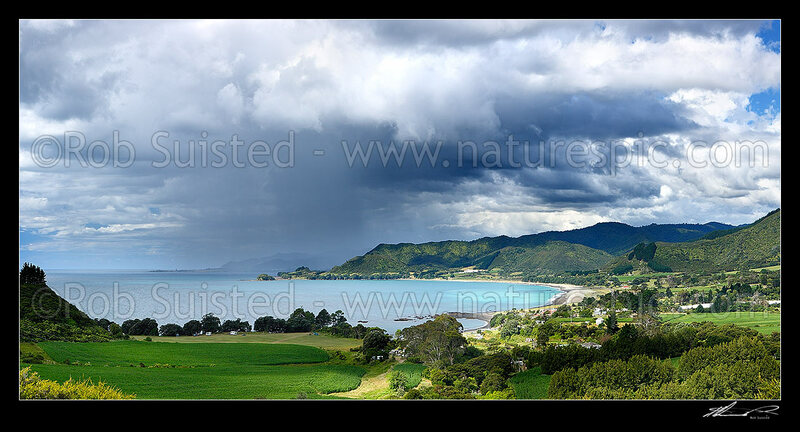 Looking across Omaio Bay, Otuwhare and Omaio township towards Te Kaha Point in distance, with weather rain storm cloud over Okahu Point and coast. Panorama, Te Kaha, East Cape, Opotiki District, Bay of Plenty Region, New Zealand (NZ) stock photo image from New Zealand (NZ). Looking across Omaio Bay, Otuwhare and Omaio township towards Te Kaha Point in distance, with weather rain storm cloud over Okahu Point and coast. Panorama, Te Kaha, East Cape, Opotiki District, Bay of Plenty Region, New Zealand (NZ) stock photo image (Picture ID #: 47136TN00).